Fancy a little Mexican food? 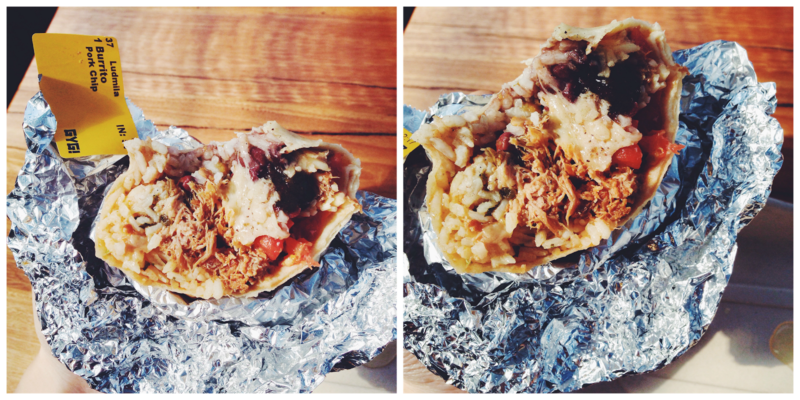 If you are in Sydney, you have got to check out Guzman Y Gomez. You might not be able to tell through the computer screen...but I am trying so hard to hold my emotions. Lmao. The burito I had was so good. So so good. Tried several Mexican restaurants in Malaysia and I can tell you that nothing I've had could even compare to this. Rice, jack cheese, vegetarian black beans, salsa and filling, rolled in soft tortilla and the filling I went for was spicy pork chipotle. Gosh. The flavour was so good. Plus, dipping sauce Guzman Y Gomez provided at the little sauce bar was amazing. Come to think of it, something hilarious happened at the restaurant. Because I love spicy food, it's a natural instinct to go for the hottest sauce available. I couldn't recall the exact name of the sauce but it was so spicy till the point where I got dizzy. Not even joking. Hahaha! If you ask me was my trip worthwhile and was it worth breaking the calories threshold? [They actually disclose the cal value for each meal served] I say yes. Eat first. Think later. We've only had this once, but t was amazing! This post is definitely making us hungry even though we've only had lunch!